Sara-Anne Lee is a published author, designer, and calligrapher based in Cleveland, Ohio. She is currently a Senior Technical Writer on the product team at StreamLink Software where she writes and designs end-user software documentation and policy documentation, maintains and designed two support sites, and provides web accessibility guidance. In addition, Sara-Anne is an Adjunct Faculty for Cuyahoga Community College where she teaches Publication Design and Typography and Layout in the Visual Communication & Graphic Design department. In her free time, Sara-Anne is a member of the Calligraphy Guild of Pittsburgh and owns her own freelance business. Previously, Sara-Anne worked as a contractor technical writer for the NASA Safety Center in Cleveland, Ohio, supporting the NASA Safety Center and the Office of Safety and Mission Assurance and was Managing Editor for Carnegie Mellon University Press. 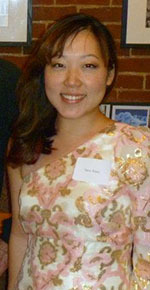 Sara-Anne attended Carnegie Mellon University in Pittsburgh, Pennsylvania, and graduated with a double-major in Professional Writing and Creative Writing. In 2010, Sara-Anne earned her Masters in Professional Writing, with a concentration in editing and publishing. Copyright © Sara-Anne Lee. All Rights Reserved.